As one of the largest and most beautiful cities in Europe, Budapest is a must-stop for anyone traveling to Eastern Europe. Here, in the capital city of Hungary, you’ll find a nice mix of history and modern metro-sprawl. A two-day visit should be enough time to see the most iconic sites of the city, enjoy a stroll along the Danube and learn a little history. 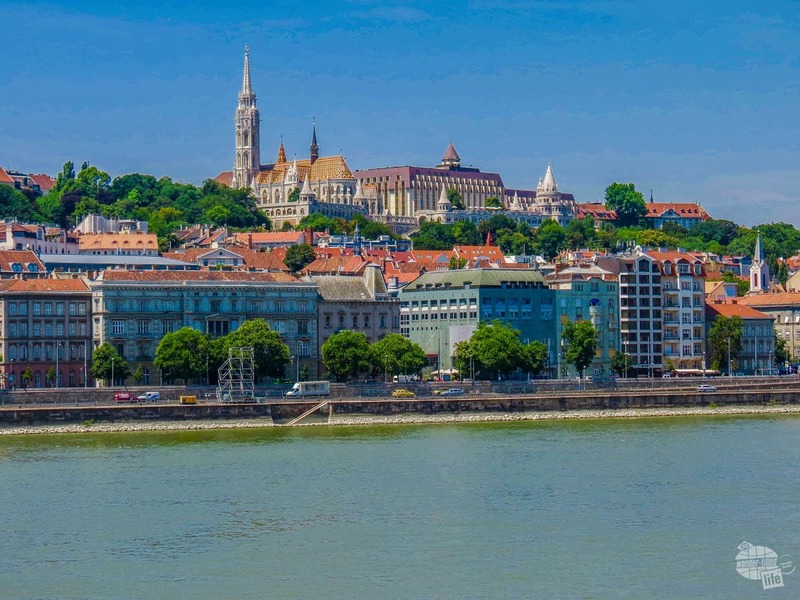 Located on the river Danube, Budapest was originally two cities…Buda on the west side of the river and Pest on the east side. Today, Budapest is one large city, but the two sides are still known at Buda and Pest. 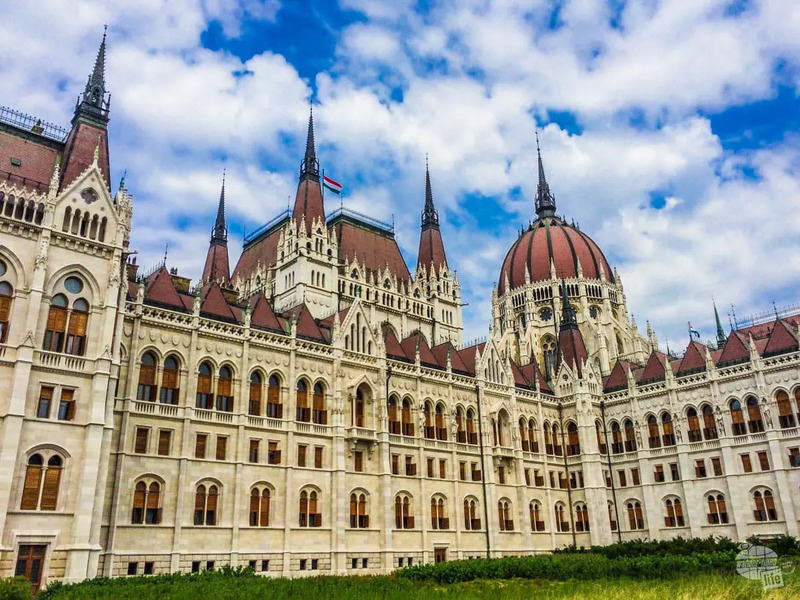 In Pest, you will find the Hungarian Parliament, the Great Synagogue, St. Stephen’s Basilica, the Hungarian State Opera House, Great Market Hall and Szechenyi Baths, which is perhaps Budapest’s signature attraction. Buda is home to Matthias church, Memento Park, Hospital in the Rock, the Hungarian National Gallery and Castle Park. We arrived in Budapest on the night train from Krakow. There are several different train stations in Budapest, so be sure you know which one you are arriving at and departing from. 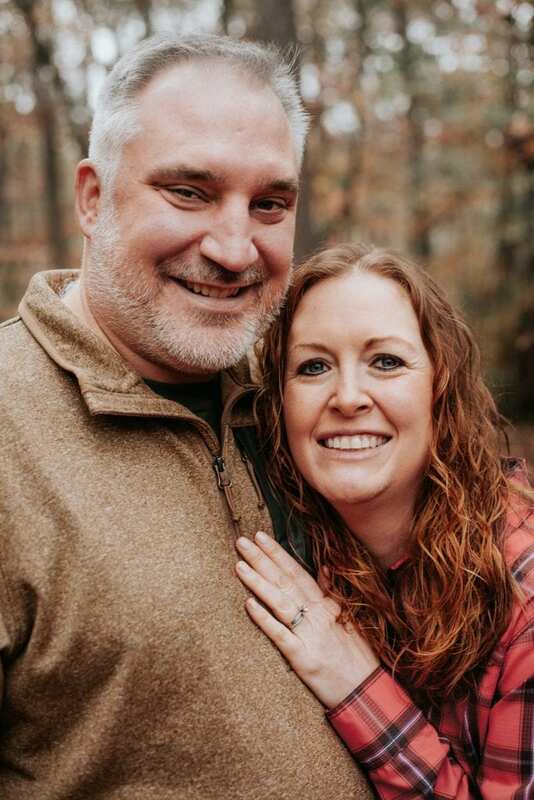 Upon our arrival, we were immediately met with chaos: large crowds throughout the station, long lines at the ATM and a somewhat confusing bathroom. 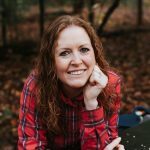 When this happens, the best advice we can give is to not let yourself get overwhelmed…just take it one step at a time. First stop was the ATM for local currency. Yes, Hungary (like many counties in Eastern Europe), uses their own currency, the Hungarian Forint, rather than the Euro. This meant we couldn’t do much of anything without first stopping at the ATM. In terms of the bathroom: there was a charge, which is fairly standard at public places in Europe. The part we didn’t anticipate is that you needed to get toilet paper BEFORE going into the stall. Needless to say, this was a little frustrating to figure out AFTER you were in the stall with very full bowels. Once we took care of these basic tasks it was time to get a local train into town and drop off our bags. Thankfully, that part was easy. Public transportation in Hungary is fairly abundant, with a nice system of buses, trolleys, trams and an underground train (metro). An above-ground train system keeps the suburban areas connected. 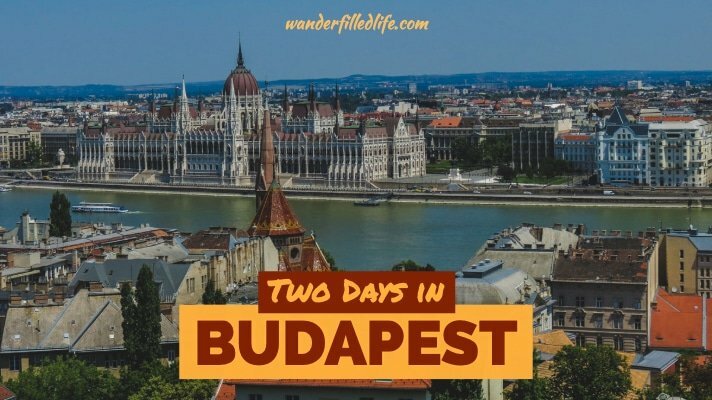 After navigating ourselves to our apartment rental to drop off our bags, we headed straight for a walking tour of the city with Discover Budapest. The first thing I want to point out here is that we are NOT “tour group people.” Typically, we avoid tours at all costs. I know that many people love tours for the ease and comfort they provide. We just generally do not enjoy touring as a pack and being told where to go. But, this particular tour was recommended in the Rick Steves’ Eastern Europe guidebook and by a friend who lives in Budapest. With two trusted sources recommending the tour, we decided to do it and we were glad that we did. Thankfully, our group was small, with only five people. 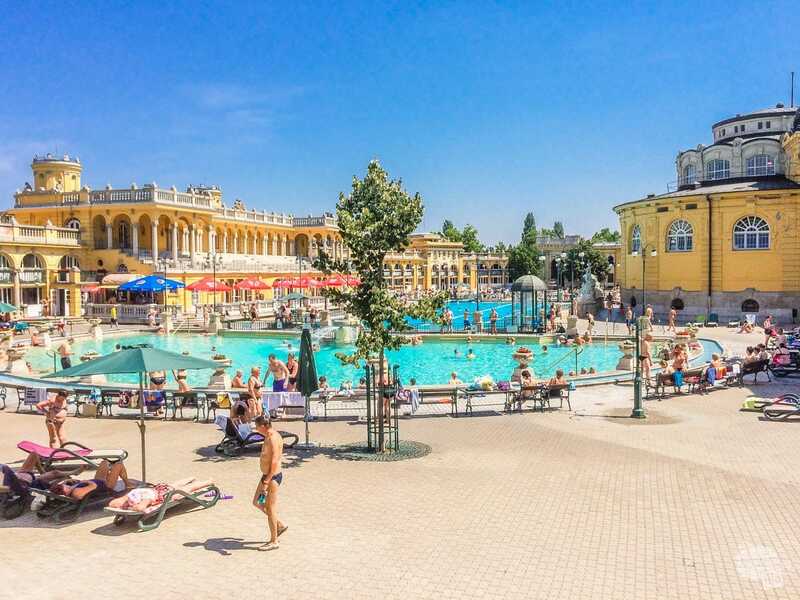 The tour gave us a peek at a lot of the major sites of Budapest including Szechenyi Baths, Vajdahynyad Castle and Hero’s Square. Additionally, the tour guide provided a good overview of the history of Budapest. Overall, the tour was a good experience, even if it did require a lot of walking in the extreme heat. Yep, unfortunately, our visit to Budapest occurred as a major heat wave hit much of Europe. Indeed, the afternoon temperatures were at or above 100 degrees for the entirety of our visit. Thankfully, the tour did include a stop for snacks and a couple of rides on the metro, which provided relief from the heat. I have to say, Hungarian pastries are quite tasty! And, a little bit of transportation history: Budapest’s Metro is the oldest electrified underground railway system in Europe. Line 1 is the oldest line and has been in constant operation since 1896. For our second day, we revisited a few of the sites that we breezed by on the walking tour and spent more time across the river in Buda. We started our day by walking down to the Parliament building, located right on the Danube. 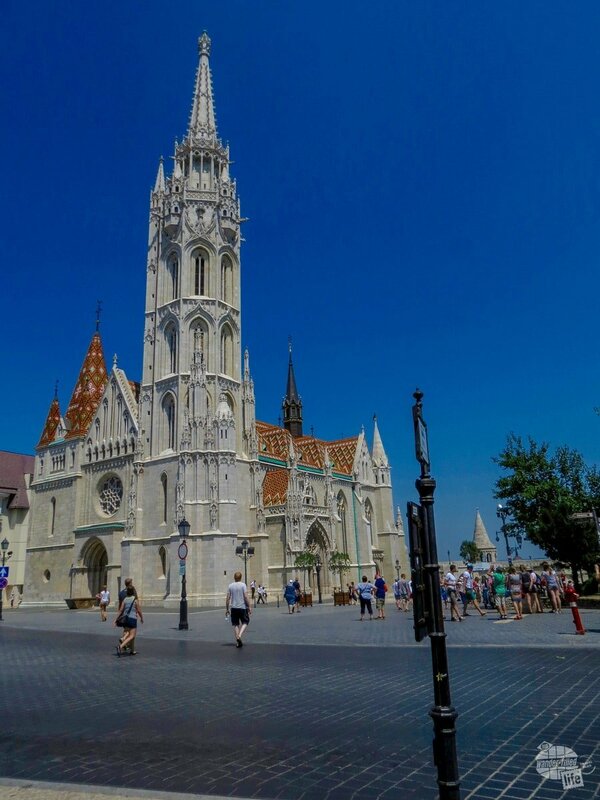 Built in the Gothic Revival style, the abundant spires make it one of the most recognizable buildings in Budapest. While tours of the inside are available, we just admired it from the outside. Near the Parliament building is Kossuth Tér Massacre Memorial, a small museum to the 1956 rebellion. It serves as a memorial to those who died and has a flag that the rebels cut the communist seal out of. This underground museum was an interesting find and certainly worth the time for a quick tour. From here we wandered until we ended up at the square next to the U.S. Embassy. The square is home to a statue of Ronald Regan, a placation to the U.S. Government for some freedom of speech and press issues. 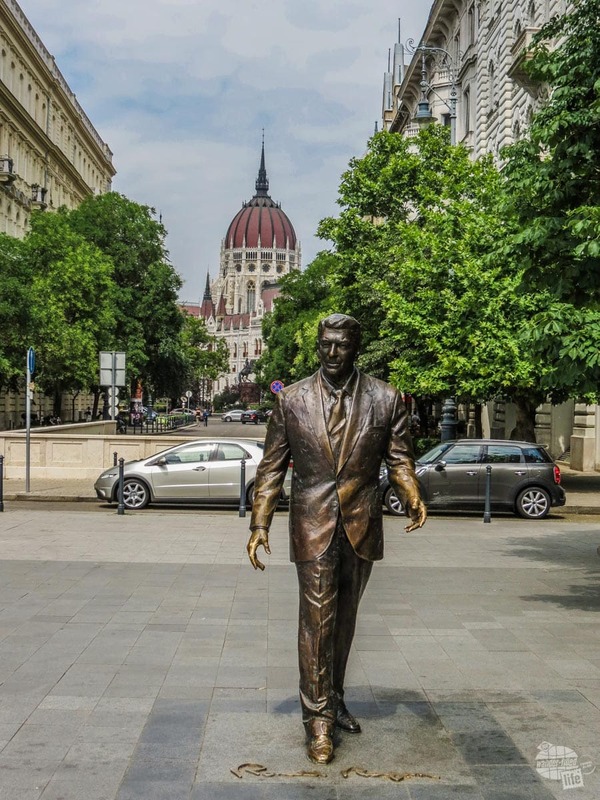 Ronald Regan’s statue in Budapest. After a quick lunch, we headed to St. Istvan’s Basilica (St. Stephen’s, in English), Budapest’s largest church. As one of the two tallest buildings in Budapest, the church is known not only for its spectacular view of the city but also for a few unique features. 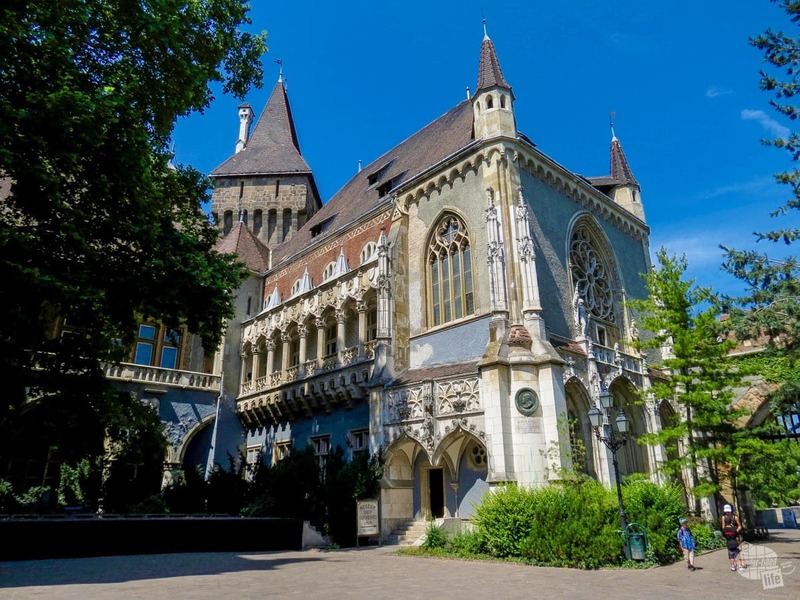 Named in honor of Stephen, Hungary’s first king, the altar does not have Christ on it, but rather Saint Stephen I. Additionally, a chapel to the left of the main altar houses St. Stephen’s “incorruptible” right hand. After touring the inside of the church, including a viewing of the mummified hand of St. Stephen, we climbed to the top of the basilica to a very nice view of the city. 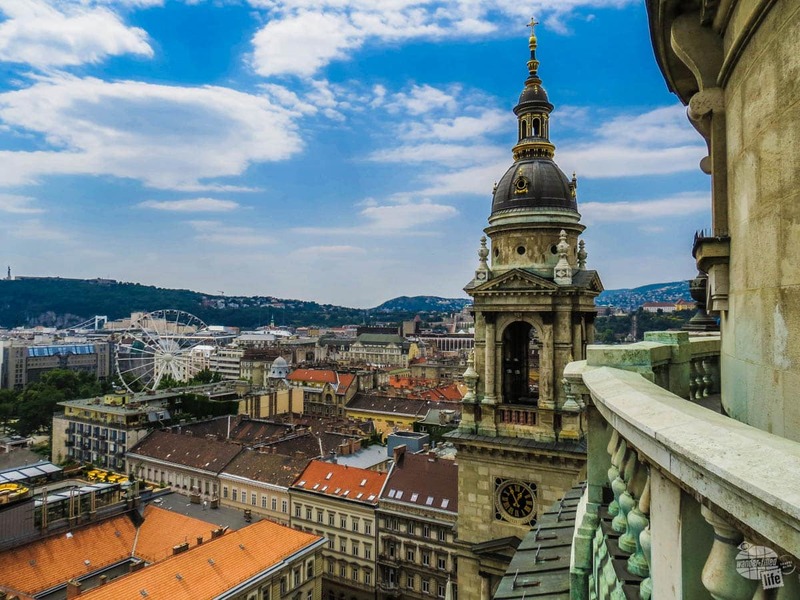 At 315 feet high, the basilica dome is the same height as the Budapest Parliament building. In fact, regulations state that no other building in Budapest can be taller. Sharing the title of tallest building honors the balance between church and state in Hungary. To reach the observation deck, you can climb 364 steps or take an elevator. We chose the stairs, probably because it was cheaper. As usual, I was terrified of the heights, held tightly to the handrails and pasted myself to the wall at the top. While I always know this will be my reaction, my desire to get the best views of the city often wins out. That and I don’t want to sit by myself while Grant enjoys the views without me. After a quick jaunt to the Opera House, we took the metro and bus back across the river to visit the Hospital in the Rock. First, let me say that Hospital in the Rock Nuclear Bunker Museum is one of the most unique attractions that we’ve ever been to. It is certainly worth a visit for anyone in Budapest. For us, it was also a fabulous way to escape the incredibly high temperatures! 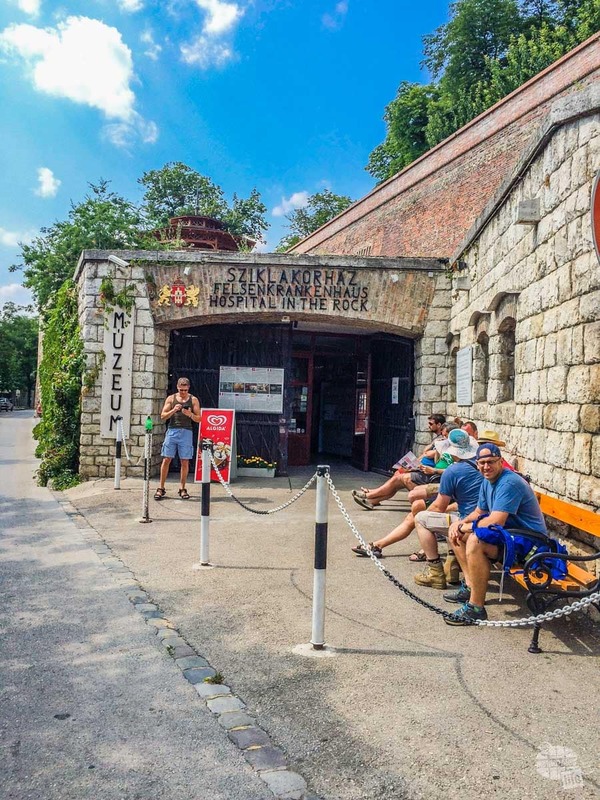 Housed in the cave system beneath Buda Castle Hill, the Hospital in the Rock museum is dedicated to a former secret emergency hospital and nuclear bunker. At its deepest, it is under 17 meters of rock underneath the palace. The entrance to the Hospital in the Rock museum. Originally, the caves under the palace were going to be used as a bomb shelter pre-WWII. During the siege of Budapest, however, it was used as a hospital. It was used again in the 1956 rebellion to treat the wounded and was set up as a nuclear shelter and treatment area during the Cold War. The tour takes you through the hospital and decontamination equipment, with quite a few different exhibits set up along the way. 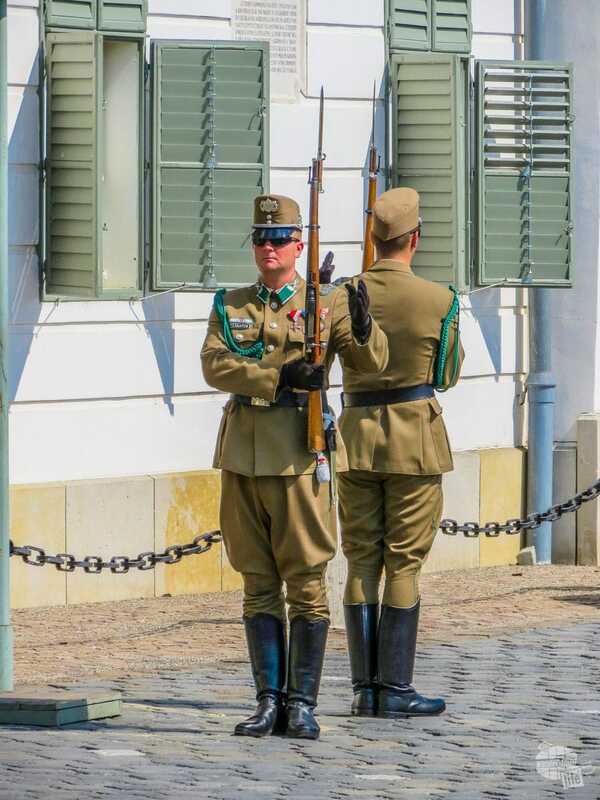 After the tour at Hospital in the Rock, we wandered around castle hill a bit and managed to see the changing of the guard. It is always interesting how different that ceremony is at various locations, especially in different countries. Having had enough of the heat and humidity at that point, we headed back to the room for a shower and late dinner. For our three nights in Budapest, we stayed at Town Hall Apartments. Here we had a reasonably priced studio apartment which included a small kitchen, a bathroom, a terrace/balcony and a washing machine. While the apartment itself was great, the best part of it was the location near the Opera House and a large metro station. Additionally, there is a supermarket next door and a great restaurant/bar/nightlife scene just a few blocks away in the Kazinczy Street district. 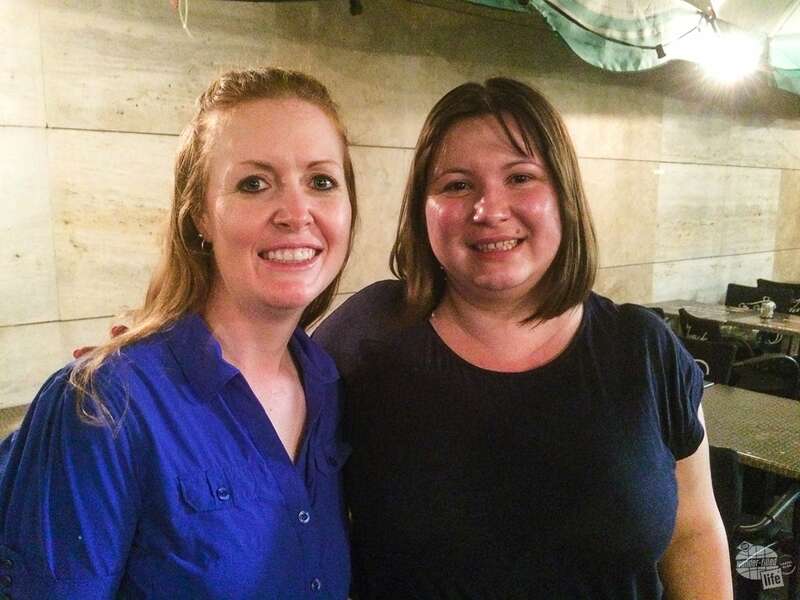 Catching up with a friend in Budapest. Even better for us personally…my friend that we planned to visit here actually lived in the same building, which I did not know when I made the reservation! Yes, sometimes it is a small world that we live in. Perhaps our most memorable restaurant from Budapest was a small Doner kebab joint just down the road from our apartment. While this may not be traditionally Hungarian, it was tasty, inexpensive, quick and convenient. Along Kazinczy Street, we found many different types of restaurants. In fact, the sheer number of restaurants was a bit overwhelming. We ate at a couple of different places while we were in town. Both were good but nothing to get overly excited about. In general, Budapest has a bit of a foodie flair to it, with many different offerings. We enjoyed the options but it was sometimes a bit difficult to find traditional Hungarian cuisine. Budapest does have a fairly impressive microbrewery selection. And their signature red wine, Bull’s Blood, quickly became a favorite of ours. In fact, we almost always have several bottles in our bar at home these days! Budapest is huge! Seriously, it is a city with a lot of sprawl and many interesting sites. While you can see the highlights of the city in two days, three or four days would allow you to see and do even more. Of course, just slowing down can also be a good thing! I know we would have loved to return to the baths and actually take a soak. A dinner cruise on the Danube would be another good option with a little more time. And there are quite a few additional museums, parks and churches that we did not have time for. 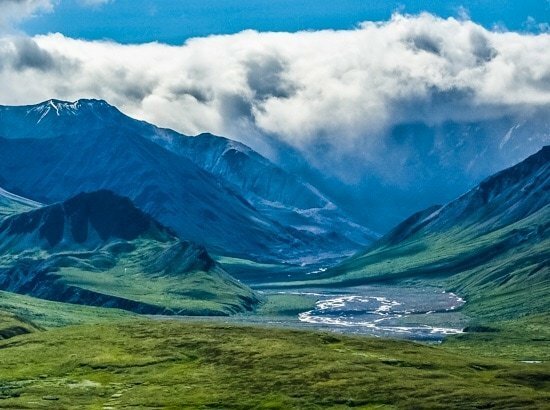 Additionally, one of our favorite things to do is to get outside of the city. This is actually how we spent our third day: a visit to nearby Eger. 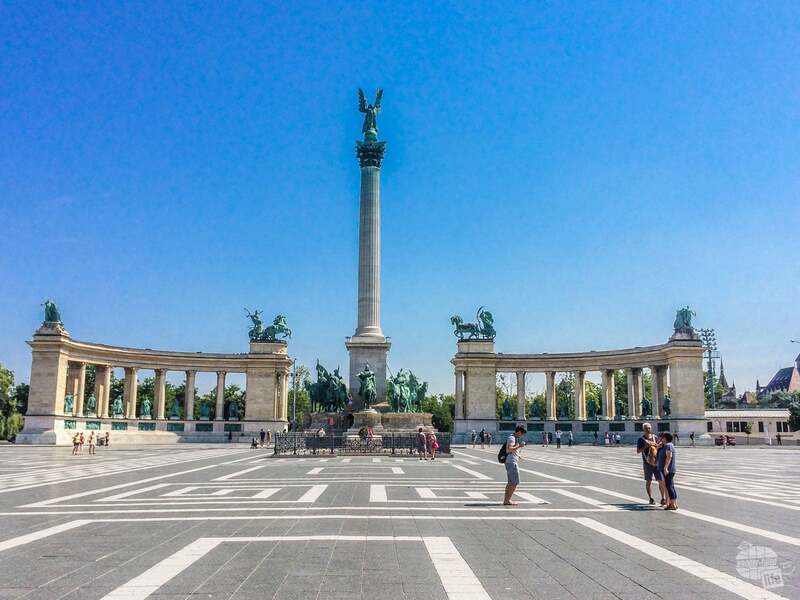 The large cities, such as Budapest are certainly must-see cities for good reason. But there is just something about the charm and intimacy of a small town that really tells the story of a country. 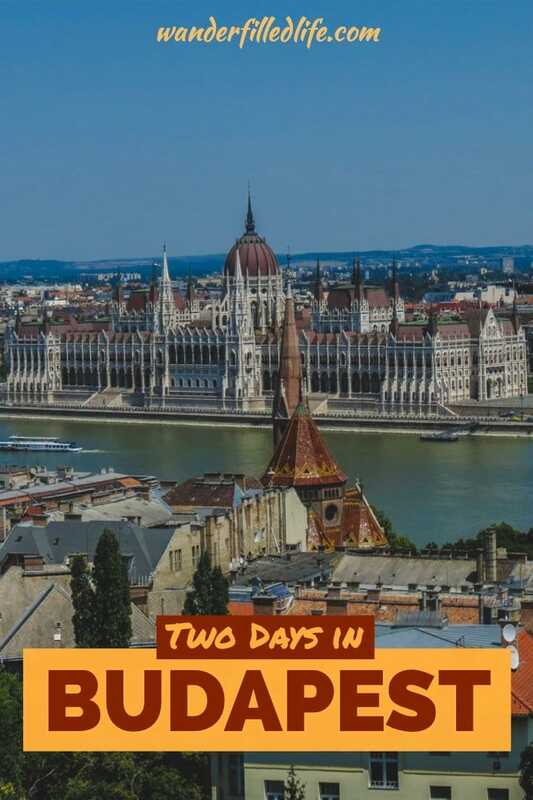 If you’re planning a visit to Europe, especially Eastern Europe, Budapest is a great city to include on your itinerary. The history and architecture are interesting and there are many unique attractions. Budapest may not have the same budget-friendly prices as much of Eastern Europe, but it is still worth a visit. It is certainly much more cosmopolitan and modern than some other cities while maintaining the Eastern Europe charm. We certainly enjoyed our visit and highly recommend stopping in Budapest for at least a couple of days.